After a long, cold winter there is a pent up demand for a transmitter hunt! These avoid major radio events, Hamvention, etc. It will not be back-to-back Saturdays as listed as we try to space the hunts every two weeks. Of course, the weather is the big variable and can make the final selection a moving target! Consequently, we will finalize dates as we go along. Dinner afterward to be determined before the start of the hunt. (We are conducting KARS Foxhunts under "Total Mileage" rules. Rules and directions are listed at the bottom of this page. 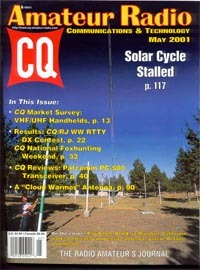 "Links to Other Foxhunting Websites Around the World below"
April 2004 "CQ Magazine Article"
May 2001 "CQ Magazine Article"
April 2003 "CQ Magazine Article"
Thanks to "CQ Amateur Radio Magazine"
We appreciate the notoriety very much! parking lot just west of the cinema. Check out the small map below to Meadowview. that would be glad to show you the ropes! The parking lot is the X 'ed oval area. for those not familiar with the area. Kennedy Dr (Rt 45) and Brookmont Blvd. in the middle of the Meadowview Shopping Center. builder / designer Joe Leggio WB2HOL. CQ magazines® Homing In Column. for the morning Foxhunt / ARDF talks. 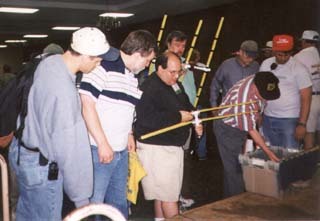 at the Dayton HamVention® ARDF Forum in 1999.
fox hunters gathered around one of the outdoor vendors that was selling fox hunt transmitters. I stopped and soon Marvin Johnston KE6HTS struck up a nice conversation about t-hunts and the like. 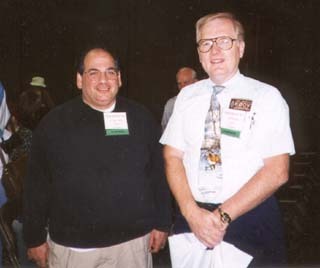 I didn't find out till the next morning that Marvin was one of the featured guest speakers of the ARDF talks. Very nice down to earth fellow indeed. Marvin is mentioned throughout Homing-In. 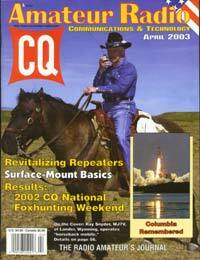 by ARRL and CQ's Foxhunting Guru Joe Moell K0OV. KARS Fox Hunts are "mobile hunts"
KARS 146.34 / 94 repeater system. hunts done from your automobile! fox hunts are as follows. 1) Somewhere in Kankakee County. 2) On public property, (publicly accessible). 3) The fox cannot move. (Go mobile). 30 to 45 seconds duration. less than 90 seconds apart. 5) Transmissions will be conducted on 146.34 Mhz. 5) Power changing is OK.
6) Polarity changing is OK.
when he / she has been found please. 8) Pretty much anything else goes. 9) Please DRIVE SAFELY !!! 10) We are now under mileage rules. 11) New 2 hour rule. meet at a predetermined restaurant. Again, Please DRIVE SAFELY !!! Would you like your FOXHUNT website listed here?